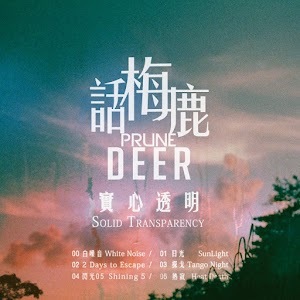 Hong Kong locals Prune Deer open their almost-six tracker Solid Transparency with 29 seconds of white noise, which is either clever and postmodern or a bit pointless and annoying. But although the hiss carries through to track two, it quickly fades into the shimmering, largo soundscape of “Sunlight”. The sun seems to be rising as the first cymbal crash heralds daybreak (exactly how I like start my day) before gearing up into a fairly rocking instrumental. A caffeinated charge gives way to the aural equivalent of a drive in the countryside, via a couple of time changes, before ending in something like a three-car pile up. A strong start. “2 Days to Escape” introduces some funky drummer amid twinkling guitar interplay, bouncing between duple and pentuple time as the “math rock” label demands. The bass drive is a bit 1980s Herbie Hancock – which is perhaps a matter of taste – and there are dashes of theatre that would be uplifting live while sounding a wee bit Joe Satriani – remember Surfing With the Alien? – on record. That’s followed by the energetic disco funk of “Tango Night”, which has a Miami soundtrack vibe, and the package concludes with “Shining” and “HeatDeath”, offering more of what we’ve already heard. I love me a good instrumental outfit these days, and a bit of math adds welcome spice. But I’m not sure what we’re supposed to be “post” nowadays, and I question whether an act that doesn’t buy into dissonance – which Prune Deer doesn’t, and fair enough too – should claim “noise”. But those are semantics. Essentially, Solid Transparency is just what it tells us it is. A sincere offering from a serious band with plenty of skill, but one that’s perhaps over-trying to be an exemplar of the chosen genre, and could benefit from seeking wider and deeper inspiration. This EP is only available upon contacting Prune Deer via their Facebook page.